Phineas Newborn Jr. Phineas Newborn Jr.
Phineas's solos meticulously transcribed & available for download. In my 33 years teaching at the college level, this is one of my favorite books. Bruce Dudley’s accurate transcriptions of Phineas Newborn Jr. solos gives the student a chance to study the music of a piano genius. If you are an aspiring jazz piano student or teacher, you should have these transcriptions! Associate Professor University of Tennessee, former musical director with Art Blakey. Dedicated to the Remembrance of a Jazz Genius. 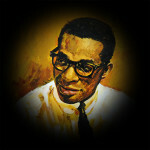 Phineas Newborn Jr. is credited as a piano virtuoso and until now his original solos were only available through recordings. It has taken 30 years and the recent 7 month dedication by Bruce Dudley to make available the meticulously transcribed, timeless masterpiece solos played/written by Phineas Newborn Jr.